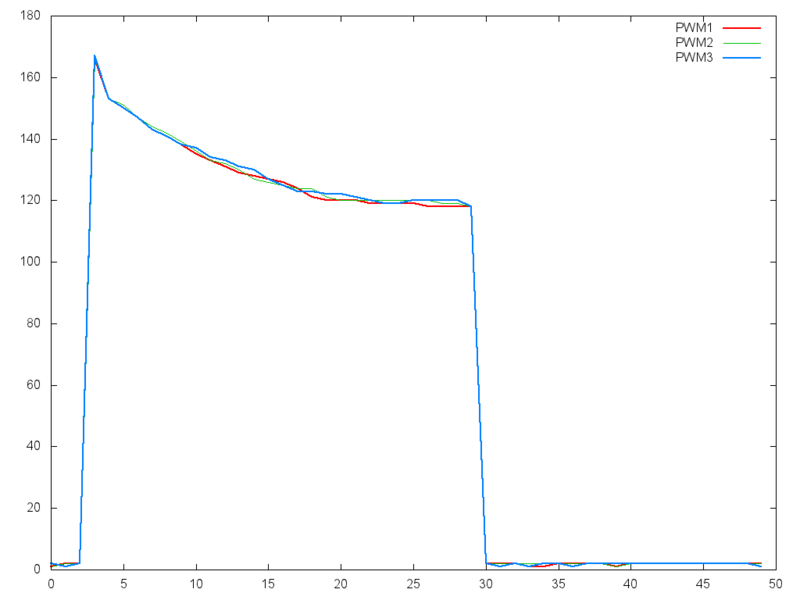 In this post I will try to describe how to dump memory contents of en embedded system and plot them using Gnuplot or some other program. To dump the memory I will connect to the target with openOCD and GDB debugger. All of the above operations can be done with a simple script. My target platform will be STM32F105 microcontroller. 1. To get started We will need to connect to the target with openOCD. It can be done from the console or from IDE such as eclipse. gdb -ex "target remote localhost:3333"
-ex "monitor reset halt" -ex "break *0x080029dd" -ex "continue"
-ex "dump binary memory c:/data/p1.hex  0x20000d88 0x20000DEC"
-ex "dump binary memory c:/data/p2.hex  0x20000e50 0x20000EB4"
-ex "dump binary memory c:/data/p3.hex  0x20000f18 0x20000F7C"
'c:/data/p3.plot' with lines ls 3 title 'PWM3';"
set VAR_GDB_CMD=-ex "target %VAR_GDB_TARGET%" -ex "%VAR_GDB_RESET%"
-ex "break *%VAR_GDB_BREAK%" -ex "continue"
-ex "dump binary memory %VAR_MEM_FILE%  %VAR_GDB_START% %VAR_GDB_END%"
These are all the things that We need to do in order to plot memory contents of an embedded system. -ex "%VAR_GDB_RESET%" -ex "break %VAR_GDB_BREAK%" -ex "continue"
-ex "dump binary memory %pathname%/p1.hex  0x20000d88 0x20000DEC"
-ex "dump binary memory %pathname%/p2.hex  0x20000e50 0x20000EB4"
-ex "dump binary memory %pathname%/p3.hex  0x20000f18 0x20000F7C" -ex "quit"
What gave me the idea for the script? The idea came after using Texas Instruments Code Composer Studio IDE which gives the possibility to plot memory contents on a graph. At work I was doing a project on STM32F1 series microcontroller. The device was doing some voltage and current measuring with the internal ADC. I thought it would be good if I could plot the data without the need for sending it through serial port or some interfaces. 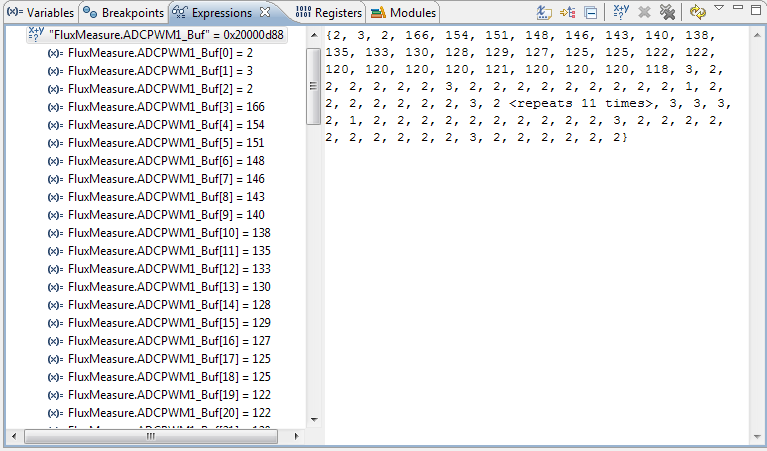 How to trigger the memory dump breakpoint? To dump the memory we need to halt the target. It can be done with a breakpoint. In my opinion it is good to set the breakpoint at some line we can trigger from an external interface. For example if Your device uses serial port for debugging or any non critical transmission. You can send a command that triggers the breakpoint. Another way is to implement a trigger in Your code. You can put an additional line which will be triggered on spacial occasions a and will be used for the breakpoint only.